Arab journalists demonstrate against Al-Quds newspaper over Civil Administration ads regarding Judea and Samaria construction. 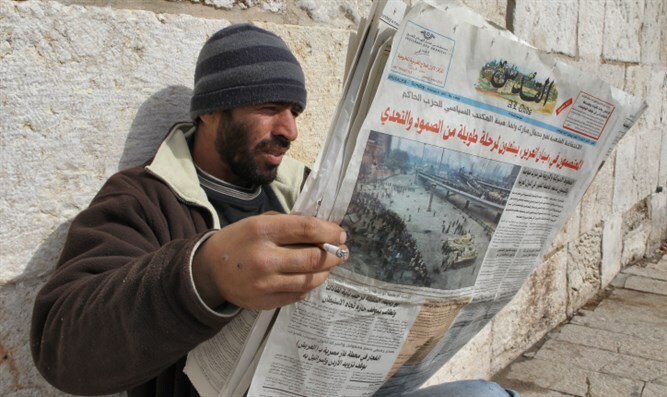 Dozens of journalists in the Palestinian Authority demonstrated opposite the Palestinian Journalists' Association headquarters in Ramallah, demanding that the newspaper Al-Quds stop advertising Civil Administration advertisements regarding construction in Judea and Samaria. The advertisements of the Israel-based administration concern outline plans for new construction of Jewish communities in Judea and Samaria. Murad Al-Sudani, director of the Writers' Association, condemned the policies of the newspaper and said that it is "harming the importance of the struggle against normalization with Israel." Nasser Abu-Bacer, director of the Journalists Association, called on the Al-Quds newspaper to start "serving as a national institution for the Palestinian nation as it was in the past and not serve the 'occupation policies'"
He demanded that the newspaper's editors apologize for their actions. The journalists signed a petition demanding the publication of a blacklist of Arab journalists who are promoting normalization with Israel. They also demanded that legal action be taken against the Al-Quds newspaper and that Arab institutions stop advertising there.